With the release of his debut longplayer Boy Meets World the Californian rapper Fashawn aka The Phenom achieved his pipe dream. As he grew up in a virtually parentless home, he always wanted to escape with music and rhymes from the dismal prospects of his life. Only 17 he followed his dreams, dropped school and worked on a career as a truly underground Hip Hop rapper in order to spread the word with politically themed lyrics and social consciousness. After building up a steady buzz through mixtapes, his longplay debut advanced him to one of the most critical acclaimed new Hip Hop artists of the USA. And this above all because his Hip Hop style is classic and his words are full of reflective content. In Cologne he now plays one intimate, entrance free session at the Carhartt Store on Tuesday 20 July 2010 around 7 PM. 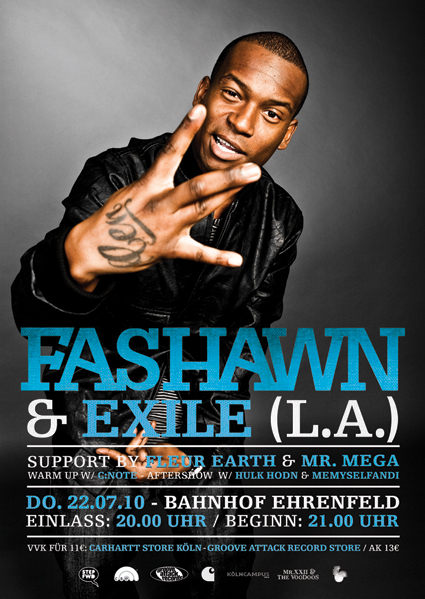 Two days later he hits the stage of the new club Bahnhof Ehrenfeld, where he team up with the exceptional American Hip Hop DJ, producer and rapper Exile.